Oscar winner Cuba Gooding, Jr. discusses how challenging it was to portray O.J. Simpson in FX’s ‘American Crime Story’ and reveals whether or not he wants to meet the disgraced ex-NFL player. Cuba also shares special memories he has from working alongside Hollywood’s finest, like Tom Cruise & Robert De Niro. “I remember Heath Ledger said after he played the joker character that it was just a darkness he couldn’t shake and I always thought that was kind of bs. I was like you’re an actor, you’re supposed to go in and out, but it’s true Larry. 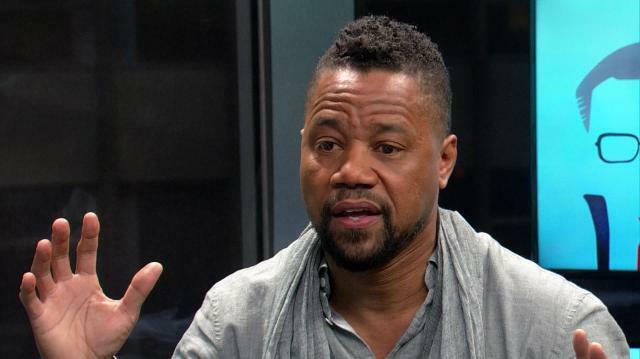 I’m telling you.” - Cuba Gooding Jr. on shaking off the role of playing OJ Simpson. “I do. I absolutely do. Towards the end I wanted to get the hell off that stage. I was burnt out. But now it’s like it’s a drug. It’s addictive. I want to get back on there.” - Cuba Gooding Jr. on performing on Broadway. “If you see when they put the boxes and they say ‘And the winner is…’ you see me looking down because I told myself don’t look up if you go (raises eyebrow) and do any reaction that provokes people because I think it was Al Sharpton-- other people are like, ‘If you don’t win it’ll be a travesty.’ And I was like, ‘I don’t want any of that racial stuff to go into this nomination.’ So when they said Cuba Gooding Jr., the first thing I was like okay cool and then as I walked up there it hit me like, ‘Wait a minute. They just said your name!” - Cuba Gooding Jr. on winning his first oscar. “I watch everything. It’s my duty to vote and whatnot but I never talk about my political affiliations. I think the reason why is because, just like with this character, you want people to come in and bring their own life values to that role and then hopefully get entertained and if you’re lucky find healing or something interesting about the portrayal. And that’s why I never tell people if I think OJdid it or he didn’t do it. My father thinks I’m a republican. My mom thinks i’m a democrat. I like it that way. I do.” - Cuba Gooding Jr. on his involvement with politics. “Every single script that was given to me, there was something shocking that I didn’t know and the facts that I thought I knew were just off in a little way. Like something as simple as— we were doing that scene where he writes his suicide note and I go, ‘Can I get the real suicide note?’ and they go, ‘That is real, sir,’ and I go, ‘No, no, no. This one has a happy face in it,’ and he goes, ‘He put a happy face in the O in OJ.’ AndI was like are you kidding me? Yeah. Stuff like that blew me away.” - Cuba Gooding Jr. on the biggest thing he learned while filming American Crime Story. “I went in and me and Robin Williams bantered back and forth and had a ball. We did that ‘Show me the money’ scene, the whole thing. Cameron, at the end of it, came up to me with James L. Brooks and he said, ‘You weren’t on my radar before but now this is your part to lose.’” - Cuba Gooding Jr. on landing the role in Jerry Maguire.